I had absolutely nothing planned for dinner. I never even thought about it until I was on my way home from work. Lucky for me, Moe is very easy and is happy with just about anything I want to serve him. Yesterday when I went to pick up a few groceries I bought a package of frozen puff pastry, which ended up in the fridge rather than the freezer. 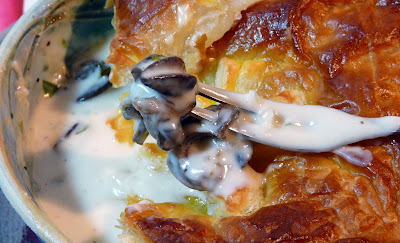 I decided to revamp an escargot appetizer recipe that Moe loves and turned it into a main course. Rather than serve it in little puff pastry or toast cups I adapted the sauce and poured the mixture into oven proof dishes and topped them with the puff pastry. Rather than add the butter to the sauce just before filling the toast cups as called for in the recipe, I made a roux, with a little butter and flour, added the cream, and the reduced shallot wine mixture, added the escargot and poured the mixture into individual oven proof dishes and topped with the puff pastry. Baked in a 450°F for about 15 minutes. Cut crusts off bread and roll out very thin. cut 2 inch rounds and fit each round gently into a well buttered 1 1/4 muffin tin. Brush tops of rounds with melted butter and bake them for 10 minutes or until edges are golden brown. 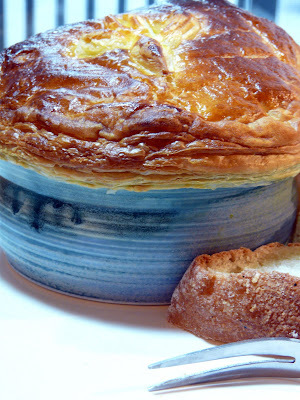 Remove from tins and cool. In a medium sauce pan combine wine, chicken stock and shallots, thyme and bay leaf. Bring to a boil and reduce liquid to 1/3 cup. Stir in cream, garlic, salt and pepper. Reduce liquid to 1/2 cup. Add escargot. Remove bayleaf and stir in butter. 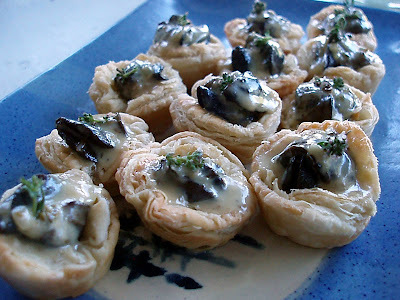 Fill each croustade with 1 or 2 escargot and some of the sauce. 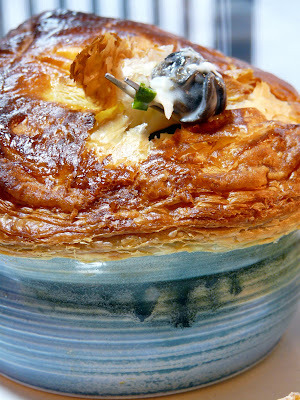 It's been so long since I've tried escargot, I'm not sure if I would care for it now or not, BUT that is one beautiful-looking meal! I would have no hesitation in trying that! Yours look great of course!